Bug on Mac, how can I reset? I have a huge problem with affinity. If I press the restore Button, it marks something but it doesn't go dark red and it doesn't work.. I don't know what to do about it. How can I delete everything I have chanced? I even deleted Affinity and downloaded it again. I am using a 15' MacBook Pro with Touchbar and the latest software.. A screenshot is attatched. What can I do? I am very greatful for every support! I'm not sure i understood you issue. Can you rephrase it please? 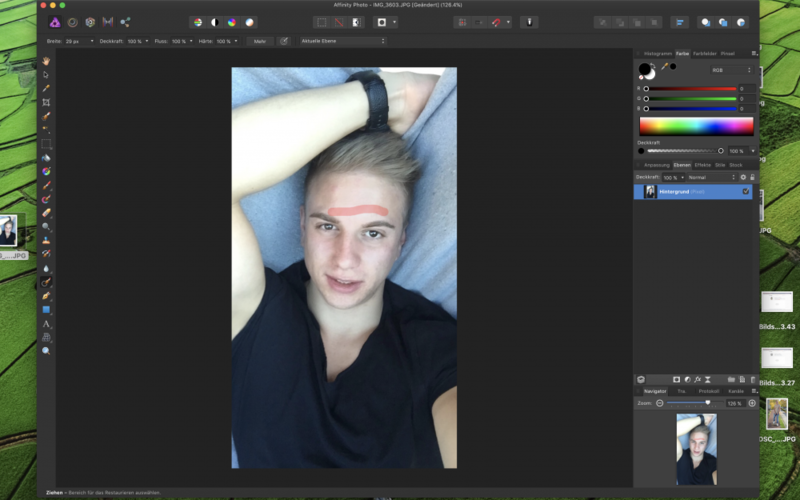 Are you saying that the Inpainting Brush Tool is not working for you? Thank you very much for your quick reply! Yes, the Inpainting Brush Tool (the one I selected on the posted photo) doesn't work anymore. I don't know why..
Can I reset Affinity, etc. to fix that? I allready deinstalled the App and reloaded it on my Mac. Is this happening in all photos or just on that one? You may have a small pixel selection active somewhere. Press ⌘ (cmd) + D to deselect any pixel selection that may be active, then try the Inpainting Brush Tool again. Does it work now? To reset the app, press and hold ⌃(ctrl) while launching the application then select Clear from the dialog that will appear. Note you may lose any UI customisations / Preferences you have made/set. Let me know if you still have trouble. Yes, the problem ocured with every picture. CMD + D didn't help but reseting finaly solved the problem. Thank you very much!